There has always been a search for marker for predicting complications of malaria. Electrocardiography (ECG) is a simple, easily available investigation, and QT-prolongation on ECG is a known marker of severity in many diseases. The QT interval represents the length of ventricular electric systole, and its prolongation may provide the substrate for ventricular arrhythmias. We tried to correlate the QT-prolongation with the complications of malaria in the present study. Like other febrile diseases, malaria increases the sympathetic tone in patients, leading to an acceleration of the electric conduction and repolarization of the heart, which can be shown as shortening of the QT intervals in electrocardiographic recordings. von Seidlein et al. found a correlation between parasitemia and corrected QT-prolongation in Gambian children with uncomplicated falciparum malaria. Another study on 161 patients with Plasmodium falciparum malaria, found abnormal ECG findings in 14.3% of all patients, including ST-segment or T-wave alterations in 15 patients and delayed conduction in eight patients. This was a retrospective, record-based study conducted from January to December 2013. We collected data from Medical Records Department of a tertiary care hospital in coastal South India where malaria is endemic. Data of patients admitted with malaria diagnosed by peripheral blood smear examination and/or antibody-based rapid diagnostic testing were reviewed. A total 92 patients diagnosed with malaria were included in this study. The data were entered in a prestructured pro forma. Complicated malaria was diagnosed based on the WHO guide lines. The definitions and the criteria for severe malaria included clinical jaundice or a serum bilirubin of >2.5 mg/dL, renal failure with a serum creatinine of >3 mg/dL, hypoglycemia with a whole blood glucose concentration <40 mg/dL, shock with a systolic blood pressure of <90 mmHg despite volume resuscitation, and severe anemia with a hemoglobin of <5 g/dL. 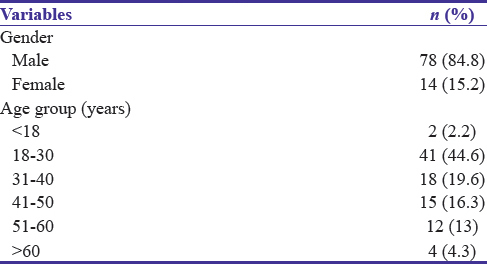 Cerebral malaria is defined as unrousable coma not attributable to any other cause, with a Glasgow Coma Scale score ≤9. The diagnosis of malarial hepatitis was made with the demonstration of malarial parasite by peripheral smear examination or antibody-based rapid diagnostic testing and at least 3-fold rise in transaminase levels (alanine transaminase or aspartate transaminase) with or without conjugated hyperbilirubinemia; in the absence of clinical or serological evidence of viral hepatitis. Corrected QT (QTC) interval on ECG was calculated using Bazett's formula, QTC = QT/√RR interval. The normal QTC interval was taken as 0.44 s (440 ms). Collected data were entered into Microsoft excel sheet and were analyzed for the association using Chi-square test and multivariate logistic regression model. The statistical analysis was done using Statistical Package for Social Sciences version 17 version (IBM Corp., Armonk, NY, USA). P < 0.05 was considered statistically significant. A total of 92 patients were selected, of them 78 were male and 14 were female [Table 1]. The important laboratory features were as per [Table 2]. Mean QTC of the study group was 413.08 ± 34.8 ms [Table 2]. With regard to complications, 14 patients had hepatitis, 5 patients had anemia, 4 patients had cerebral malaria, and 4 patients had AKI. 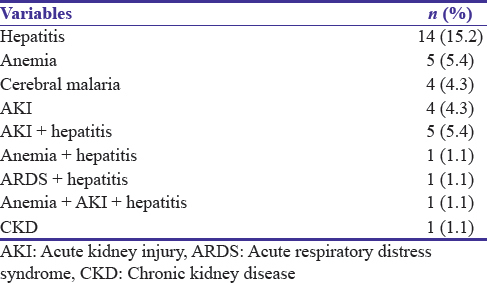 On looking for patients having multiple complications, 5 patients had hepatitis and AKI, 1 patient had anemia and hepatitis, 1 patient had acute respiratory distress syndrome and hepatitis, and 1 patient had anemia with AKI and hepatitis [Table 3]. Twelve patients had QTC >440 ms, of them 10 had complications associated. Among 80 patients with normal QTC, 17 had complications associated with P < 0.001. 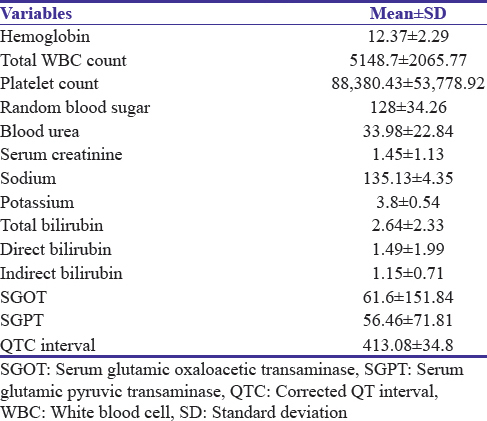 Specificity of prolonged QTC for identifying complicated malaria was 83.33%, and sensitivity was 37.03% [Table 4]. Mean platelet count in study group was 88,380.43 cell/mm3. Mean platelet count in patients with prolonged QTC was 69,741.28 cell/mm3. This shows that patients with QT-prolongation had higher rate of complications and lower platelet count. 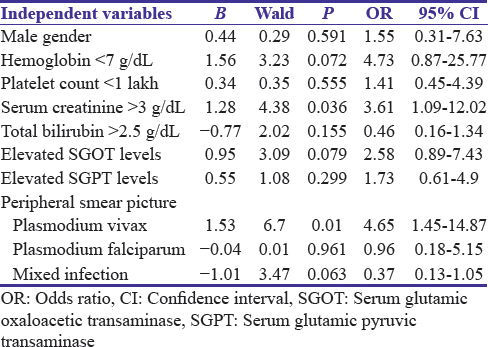 On multivariate logistic regression model with QTC interval as the dependent variable, QTC was significantly associated with AKI (P = 0.036) and Plasmodium vivax malaria (P = 0.01) [Table 5]. Mean serum potassium level in all patients was 3.8 mEq/L, and in patients with prolonged QTC was 3.68 mEq/L. The present study shows a QT-prolongation in 12 (13%) of patients admitted with malaria in tertiary care hospital of whom 10 (83.3%) had complications of malaria whereas among 80 (86.9%) patients without QT-prolongation, 17 (21.25%) had complications (P< 0.001). This shows a significant association of QTC prolongation with complicated malaria. QTC prolongation is shown to be highly specific for associated complications of malaria. However, its sensitivity is shown to be poor. Roggelin et al. found a mean QTC was 422 ± 32 ms on admission, and the mean QTC was 413.08 ± 34.8 ms in the present study. Roggelin et al. also showed that QTC could get even more prolonged after initiating therapy. Since the present study is a retrospective study, no such information could be gathered. On looking into the complications of malaria by multivariate logistic regression model with QTC interval as the dependent variable, the present study showed statistically significant association with renal failure only. Roggelin et al. showed statistically significant higher QT interval with patients with jaundice, acidosis, and respiratory distress. Soni et al. found prolonged QT interval in 26% of total malaria patients and QT-prolongation was significantly prolonged in patients with complicated malaria. This difference could have been due to the inclusion of more complicated malaria patients by Soni et al. than the present study. Franzen et al. showed ECG abnormalities in 22% of patients. Günther et al. found ECG abnormalities in 14% of patients. Hypokalemia and hypocalcemia are two electrolyte disturbances which can lead to QTC prolongation. In the present study, mean serum potassium was marginally lower in patients with QTC prolongation. Serum calcium level was not considered in the present study. Another limitation is the retrospective nature of the study with a small sample size, and the QTC was not taken at follow-up or after the initiation of antimalarial drugs, which could alter the results. Prolonged QTC was significantly associated with vivax malaria. Prolonged QTC has high specificity and low sensitivity for identifying patients with complicated malaria. Prolonged QTC is significantly associated with AKI in malaria. Hence, malaria patients with prolonged QTC should be more carefully watched for complications. Severe falciparum malaria. World Health Organization. Communicable diseases cluster. Trans R Soc Trop Med Hyg 2000;94 Suppl 1:S1-90. Mishra SK, Behera PK, Satpathi S. Cardiac involvement in malaria: An overlooked important complication. J Vector Borne Dis 2013;50:232-5. Herr J, Mehrfar P, Schmiedel S, Wichmann D, Brattig NW, Burchard GD, et al. Reduced cardiac output in imported Plasmodium falciparum malaria. Malar J 2011;10:160. Janka JJ, Koita OA, Traoré B, Traoré JM, Mzayek F, Sachdev V, et al. Increased pulmonary pressures and myocardial wall stress in children with severe malaria. J Infect Dis 2010;202:791-800. Kuo CS, Amlie JP, Munakata K, Reddy CP, Surawicz B. Dispersion of monophasic action potential durations and activation times during atrial pacing, ventricular pacing, and ventricular premature stimulation in canine ventricles. Cardiovasc Res 1983;17:152-61. White NJ. Cardiotoxicity of antimalarial drugs. Lancet Infect Dis 2007;7:549-58.
von Seidlein L, Jaffar S, Greenwood B. Prolongation of the QTc interval in African children treated for falciparum malaria. Am J Trop Med Hyg 1997;56:494-7. Günther A, Grobusch MP, Slevogt H, Abel W, Burchard GD. Myocardial damage in falciparum malaria detectable by cardiac troponin T is rare. Trop Med Int Health 2003;8:30-2. Severe and complicated malaria. World Health Organization. Division of control of tropical diseases. Trans R Soc Trop Med Hyg 1990;84 Suppl 2:1-65. Murthy GL, Sahay RK, Sreenivas DV, Sundaram C, Shantaram V. Hepatitis in falciparum malaria. Trop Gastroenterol 1998;19:152-4. Bazett HC. An analysis of the time-relations of electrocardiograms. Ann Noninvasive Electrocardiol 1977;2:177-94. Goldberger AL. Electrocardiography. In: Kasper DL, Braunwald E, Fauci AS, Hauser SL, Longo DL, Jameson JL. et al. editors. Harrison's Principles of Internal Medicine. 19th ed. New York: Mc Graw-Hill; 2015. Roggelin L, Pelletier D, Hill JN, Feldt T, Hoffmann S, Ansong D, et al. Disease-associated QT-shortage versus quinine associated QT-prolongation: Age dependent ECG-effects in Ghanaian children with severe malaria. Malar J 2014;13:219. Martínez-Salazar EL, Tobón-Castaño A. Platelet profile is associated with clinical complications in patients with vivax and falciparum malaria in Colombia. Rev Soc Bras Med Trop 2014;47:341-9. Saravu K, Docherla M, Vasudev A, Shastry BA. Thrombocytopenia in vivax and falciparum malaria: An observational study of 131 patients in Karnataka, India. Ann Trop Med Parasitol 2011;105:593-8. Leal-Santos FA, Silva SB, Crepaldi NP, Nery AF, Martin TO, Alves-Junior ER, et al. Altered platelet indices as potential markers of severe and complicated malaria caused by Plasmodium vivax: A cross-sectional descriptive study. Malar J 2013;12:462. Soni CL, Kumhar MR, Gupta BK, Singh VB, Srimali L, Nayak KC, et al. Prognostic implication of hypocalcemia and QTc interval in malaria. Indian J Malariol 2000;37:61-7. Franzen D, Curtius JM, Heitz W, Höpp HW, Diehl V, Hilger HH, et al. Cardiac involvement during and after malaria. Clin Investig 1992;70:670-3.